Perhaps no other sector highlights today’s global economic environment more than the automotive industry. In this Link Up, Learn More interview, I talk with automotive industry expert, Bill Russo, who is also the Founder and President of Synergistics Limited, and Beijing Association of Automotive Manufacturers Chairman (and retired Chairman of Beijing Automotive Industrial Corporation) An Qingheng. In order to gain an informed understanding of the US-China relationship, it is imperative to seek perspectives from both sides of the globe. This interview with Chaiman An and Bill Russo aims to do just that. If you ever wonder about the quality of a Chinese car, popping open the hood of any GM car may give you a clue. Much of the parts that comprise an American car rolls off of a Chinese production line. Scott Tong reports. BILL RADKE: As I mentioned, UAW members gather in Detroit today to learn about a proposed cost-cutting agreement with General Motors. Besides plant closings and job losses, the deal could involve GM assembling cars in China and selling them here. Can GM produce quality cars in China? Here's Marketplace's Scott Tong in Shanghai. SCOTT TONG: Consultant Kent Kedl owns a made-in-China car, and he puts it up against anything from Detroit. He drives a Regal from Buick. KENT KEDL: The Beike, they call it, is -- you tell someone you have a Beike and you're pretty cool. Kedl's Buick rolled off the GM assembly line in Shanghai about six years ago. It then accumulated what Kedl calls "China Miles." KEDL: You know, not only the stops and starts of driving in a big city like this, but you're going over a road that is being repaired, and they don't worry about smoothing the road over as they're repairing it. They just leave the human-sized potholes there. Under the hood, Kedl explains most of the parts come from China. And, he says, so do most of the components in your car. KEDL: Wiring, pumps, hoses, very often the batteries are made here. Things like hydraulics, very high-tech, highly-machined parts, some of them are still shipped in from outside. But more and more, they are made here. In 2011, GM hopes to assemble 17,000 Buick Lacrosses in Shanghai and sell them in the U.S. The company already imports cars built in Mexico and Korea. And if you wonder about China quality, former Chrysler executive Bill Russo says you shouldn't. He is an industry consultant in Beijing. BILL RUSSO: GM doesn't have a North American production system and a China production system. They have a production system. And the quality checks are the same. RUSSO: And those standards are global. They're not dumbing down the car for China. If anything, industry folks think GM's plants in China are better, because they're newer. ZHONG SHI (VOICE OF INTERPRETER): The robots in the Chinese plants are the latest. Other factories abroad bought their heavy machinery years ago, so they're not going to upgrade any time soon. Of course, China's big advantage to GM is cheap labor. And to the UAW, tens of thousands of American jobs are at stake. It's a painful reality of globalization, and Bill Russo thinks the auto industry has come late to it. RUSSO: The Apple-style rethink of where do you innovate, where do you assemble, where do you localize your parts, that fundamental rethink in this global context really hasn't occurred. 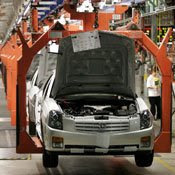 GM's union talks are still ongoing, and in the end they could decide not to import cars assembled in China. Still, the dominant view from here is it's just a matter of time before that happens. In Shanghai, I'm Scott Tong for Marketplace.